The MUSES project completed on 31 October 2018. The Project documents are still available on this website. However, no further updates or newsletters should be expected. 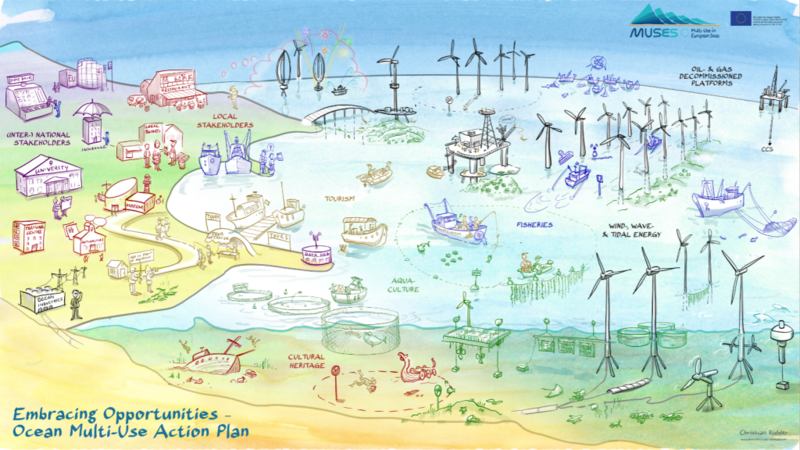 The Multi-Use in European Seas (MUSES) project is a Horizon 2020 funded project that is exploring the opportunities for Multi-Use in European Seas across five EU sea basins (Baltic Sea, North Sea, Mediterranean Sea, Black Sea and Eastern Atlantic). There are increasing demands on ocean resources as well as increasing pressure on the use of ocean space, as a result ocean space is a valuable asset deserving our special attention. Challenges may arise from tensions between maritime activities demanding marine space, and combining compatible activities in the same marine space can serve to share and reduce costs, and generate further synergies between those activities. MUSES is a two year project, co-ordinated by Marine Scotland, that commenced in November 2016 and will conclude in October 2018. There are 10 project partners from across Europe with a mix of consultancies, academia and government bodies that provide both a wide geographical coverage and broad depth of knowledge/expertise, with strong links to stakeholder groups. Highlight inappropriate regulatory, operational, environmental, H&S, societal and legal aspects.